SeaWorld finally acknowledged "The Blackfish Effect" on August 13th, 2014, when the reporting of weak park attendance and distorted projections caused an abrupt decline in the value of their stock. In an effort to stave off proposed California legislation banning captive breeding and to shore up diminishing attendance and plummeting stock prices, SeaWorld recently announced plans to expand their killer whale tanks. Moving whales to slightly larger tanks neglects the fundamental moral, ethical and health considerations that have caused the public to reject their business practices in the first place. The proposal to build larger tanks is, as the saying goes, all sizzle. But, there is a simple and economically viable solution to the problem of SeaWorld's growing exodus of paying guests. A solution exists that will allow SeaWorld to appeal to a society quickly evolving on the issue. Rather than glitzy gimmick and flashy advertising, SeaWorld must announce an end to the captive breeding of their killer whales. SeaWorld must market themselves as an improved company that focuses on accurate and innovative education and directs energy, effort and resources toward substantial marine conservation. This evolution would represent a monumental change in purpose as SeaWorld has never been about education or conservation. Clear evidence of the latter can be observed in their absent reaction to the Pacific Northwest tragedy they helped create. By supplying their tanks with so many whales captured from wild family pods, SeaWorld contributed to the current "endangered" listing of the Southern Resident killer whales. Despite this inconvenient reality, SeaWorld has never provided funding, personnel, expertise or resources toward saving the population they decimated. The public is catching on to a company that has, until recently, enjoyed complete and total control of their message. 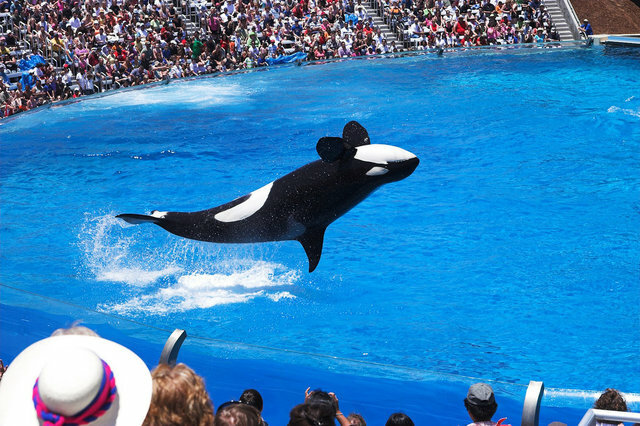 SeaWorld has benefited from genius marketing and communication programming, which has for many years served them quite well or at least until February 24, 2010 when trainer Dawn Brancheau was killed by SeaWorld's male killer whale, Tilikum. But the sizzle is waning, the steak is mostly absent, and the cat is clearly out of the bag. SeaWorld must chart a new course as a leader in marine issues. They have the resources, and the world's oceans would benefit from strong corporate representation. Amazing progress could be made if SeaWorld aimed their lobby money, political donations, and part of their advertising budget at issues that truly helped the oceans. For example, SeaWorld could wield their political influence and monetary resources to assist declining salmon stocks in the Pacific Northwest. In short, SeaWorld could help save the very population of wild killer whales they've harmed. Such a gesture would warm the hearts of millions. The turnstiles would begin spinning again. Alternatively, SeaWorld can choose to fade into irrelevance by failing to acknowledge the reality of their predicament. By redirecting their efforts and by announcing an end to captive breeding, and thus an eventual end to captivity, it's our belief that a new respect for SeaWorld could be won. In the interim the parks could continue to profit from those whales already part of their collection. Unfortunately, instead of evolving, SeaWorld has announced plans for expansion into overseas markets, including Russia, China, and the Middle East. They will soon take their show and their whales to places with fewer regulations, and for the time being, seemingly less negative public sentiment toward the practice. Precedent for this is demonstrated in their "arrangement" with Loro Parque in the Canary Islands. These endeavors may be financially lucrative for a while; at least until citizens in those countries also come to the realization that killer whales don't belong in tanks. Like those currently held in U.S. facilities, killer whales in foreign tanks will also have broken teeth, chronic infections, collapsed dorsal fins, sunburns, shortened lifespans, and missing families. Young whales will still be separated from their mothers. Spin cannot replace reality, and the reality is that killer whale captivity doesn't work for the animals, and it is becoming increasingly obvious that it fails as a sustainable business model. Our planet needs help and it is our genuine hope that SeaWorld will ultimately reject their current model, and instead evolve to meet the public's diminishing acceptance of the unnecessary exploitation of killer whales and other animals. The evidence to date, however, suggests otherwise.